You’re not alone if the following statement is true: to get everything you need to get accomplished, you plan out much of your life! Making sure you have clean clothes for work, the best route with the least traffic, a plan on how to pay your bills—the list goes on. But remember: you need to plan for good health, too! It won’t just arrive. Planning healthy living strategies and re-planning and readjusting based on life’s changing circumstances is essential for long-term weight loss or weight maintenance. It’s absolutely necessary to have a plan for day-to-day living and for challenging situations—and to do this, we have to learn how to set realistic health goals. Read on for some more tips on how to reach your weight loss goals without dieting. For example, it’s great to order fish, but not if they drown it in a butter aioli. Check out the menu on-line prior to going out for dinner—have a plan and ask how things are prepared. 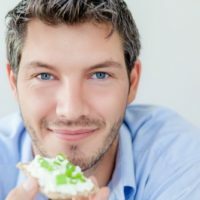 Healthydiningfinder.com can help you find options for chain restaurants. And remember that a nibble here and there throughout the day of snacks or treats counts toward your total calorie intake for the day! So re-think that mindless dip into the candy bowl at work or the fries you steal from your friend at lunch. Here are healthy tips for dining on the road, ordering take-out, making balanced choices at restaurants and recommend reading on eating out well. Know your top weight range – and don’t go above it! Twenty years after successful weight loss, I still weigh myself everyday. This keeps small weight gains from climbing. If my weight climbs over 140 pounds, I start to evaluate what I could be doing differently that’s increasing my weight. Am I adding in a mid-day snack, increasing my portion sizes, eating an extra piece of chocolate? You have to accept that sometimes an injury or life event will tip the scale –but you just refocus your efforts. Put new strategies in place or institute past ones that worked before. Preventing weight from going up is so much easier than losing it once it’s there! Plus, when you yo-yo with your weight, you’re losing muscle mass along with fat, and you may not adequately regain muscle but put fat back on–thus slowing down your burning furnace. If it creeps up it will keep creeping up—the best strategy is to nip it in the bud. This strategy has worked for me for 20 years, and it’s a habit of many successful people who have lost weight and kept it off. If you’re stuck in a plateau, re-evaluate your routine objectively by writing it out and seeing where you can make a change. They just don’t fit into a balanced diet and simply don’t offer any nutritional value for all those calories! Would you spoon feed yourself 8 to 12 teaspoons of sugar? That’s what you’re getting in a soda. I’m not a fan of diet soda, but if you really want the occasional soda, choose the diet versions. An occasional diet soda isn’t going to increase your risk of cancer or make you over-eat, and it won’t add to your waistline. Enjoy the occasional green or orange juice if it makes you happy, but do your best to eat your fruits and veggies instead of drinking them! It’s easy to underestimate portion sizes. When I get ice cream, my whole family orders their own ice cream in the kiddie cup—including the grown males! You don’t need a big portion to enjoy yourself. If you eat intuitively with awareness and mindfully savor your treat, you’ll feel satisfied. If you do have a day with too large of a portion size, cut back on your portions the next day. This doesn’t mean crash dieting, but just cut back on the treats! If you saw my office, you’d laugh! I have an Indo Board, yoga mat, foam roller, and standing/sitting desk. I didn’t buy these overnight, either. I gradually built on it. I wanted a standing/sitting desk for years, but until Ikea came out with one, they were too expensive. You can find other ways to move if you don’t have the flexibility to work from home. Try using the stairs at work. Set a timer on your phone so you get up from your desk to walk around the office for a few minutes every hour. Even just tightening your abs and doing isometric exercises on your commute or at your desk adds up! Keep in mind everyone has different metabolisms. I know I can’t have many extra treats, so overtime I’ve adapted to this and choose the sweet treats I enjoy in a small portion size. I don’t feel deprived, since I’ve found balance. I also learned to make healthy and sweet desserts! And try not to waste calories on things you’re not in love with! Just like you can choose to eat healthy foods that taste good (versus eating something just because it’s healthy), you can choose NOT to mindlessly eat foods that really aren’t worth their taste! Support groups or support helps! Support from a loving family member or friend can have a powerful impact on your weight loss. Express your goals to people who love and support you—it might help keep you accountable! Read more on social accountability with work-outs. Being rested means you’ll make better choices and have the energy to stick to your goals. Inadequate sleep can cause weight gain—even in kids. Learn more about why sleep is so important for losing weight in adults. At first making healthy changes can seem challenging and even exhausting at times. But as you build a stronger foundation, your choices will becomes habit, and you’ll feel better having more energy. It just gets easier! And always keep in mind that if you get off track, just walk back on! It’s never too late to get back on the path to a healthier living! Read 8 Secrets to Weight Loss Success. « How to Lose Weight Without Dieting Part 1.